I am a diehard Dhanush fan. He awes me with his hard work and dedication. And, most of his movies are different with unique plots and his acting is always simple which seems real. In short, I adore him. So how will I hate D25!!!! Yes! 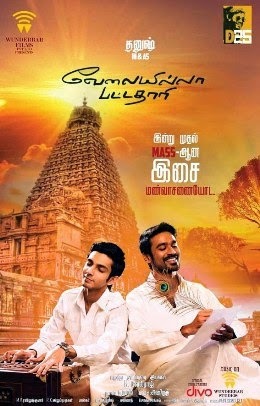 Velaiyilla Pattadhaari (VIP) is Dhanush’s 25th movie. The movie is all about a mechanical engineering graduate who is struggling to get a job in his chosen field. The screenplay is a nice mix of humor, sentiments, love and subtle heroism. The movie delivers something or the other for each strata of audience. The movie is appealing although at times, it does seem like dragging too much; editing could have been better. However, the smart dialogs comes as a rescue. There are several dialogs that would make you clap! The songs are average. The choreography is equally average. Therefore, none of the songs lingers around you or make you hum. Also, most of the songs are misplaced and pops up at the least expected moments further obstructing the flow of the movie. The dilemma and frustration of qualified yet unemployed youth is wonderfully captured in the movie. The protagonist Raghuvaran, essayed by Dhanush, takes things lightly. However, deep within, he is sad and desolate. His characterization is so real that you would recognize him as yourself or as one among the many friends you have. Dhanush, on the other hand, has made the character more believable and real! Saranya Ponvannan as Dhanush’s mother is brilliant. She shines as an understanding mother who stands by son’s harmless tantrums and speaks up when the son goes over the board. Samuthirakani as Dhanush’s father comes across as a strict father who wishes only for his son’s well-being. Amala Paul, as Dhanush’s neighbor is a dentist; well-read and very understanding. Vivek as Dhanush’s colleague comes on screen in the second half and presents his signature comedy for us. I really liked the manner in which the relationship of Raghuvaran with his family is established. The movie is run by sentiments and convictions. And, I can assure that it will strike a chord with you! In short, the movie is a mass entertainer which carries subtle heroism with it. It is real and believeable and an assured treat for all the Dhanush fan. Thus, Dhanush’s 25th film is a feast all his fans. And if you are not one, go for this and see why he is what he is today! 3 is an outstanding movie... In climax Dhanush shines... if u r his fan... u will surely enjoy this!!! We love all Dhanush movies. I watched this movie twice but everytime I watch my eyes get wet while the amma song s played.